Washington Post environmental writer Juliet Eilperin wrote another great article on Sunday, sizing up the current situation with shark fin ban legislation in the United States. As I have often mentioned in previous posts, shark conservation is moving beyond as an emotional issue - the moral indignation over shark finning does not play into it now as much as economics and cultural politics does. And Juliet deftly lays out some of the key players, pro and con, regarding growing debate over shark fin ban legislation in several east coast states. I'll let you read it to get all the details, but I'll throw in two comments that I have - one is a concern and the other is a positive note. Commercial fishermen are pressuring politicians to interject loopholes into proposed legislation. And one common proposal is allowing the landing of whole sharks. Once thought of as a way to dissuade fishermen from taking sharks because of the value difference per pound between a whole shark and just its fins, I am now concerned that, with several species, even the taking of whole sharks may prove to be one shark too many. 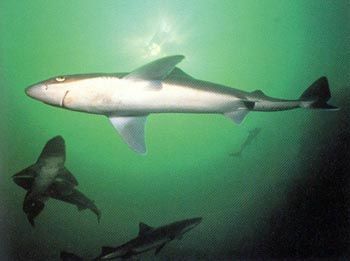 The populations of some sharks is that perilous. Persuasive arguments that address the economic, political, and cultural realities of the commercial shark market, coming from rational but persistent voices in support of shark conservation - that's the ticket. Get a good perspective as to where we're at from Juliet's article in the Washington Post.